"LOST PAGES OF BURYAT-MONGOLIAN HISTORY"
"BUDDHIST CANON IN DIGITAL SPACE"
Laborious long-term work of Buryat scholars-orintalists enabled to form up in the IMBT SB RAS one of the biggest world collections of written monuments, unique archive documents, folklore monuments which represent the national heritage of the Russian state. The volume of hand-written Buddhist canon "Ganjur" written with 7 jems from the Tibetan repository of the COMX numbering about 40 thousand entries. Now the team of the Center of Oriental Manuscripts and Xylographs carry on extensive source, textual and conceptual studies. 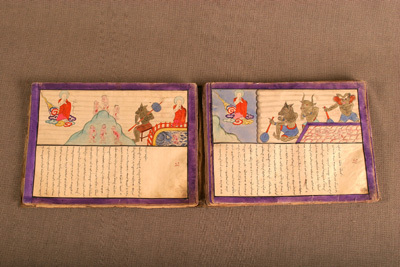 Catalogues of the Mongolian collection made in compliance with the International standards were published by our workers. Translations and scientific descriptions of valuable sources on Tibetan medicine, historical and juridical aspects of nomad states, religious practices and cults of the peoples of Central Asia, philosophy and the educational system of Buddhism were published. 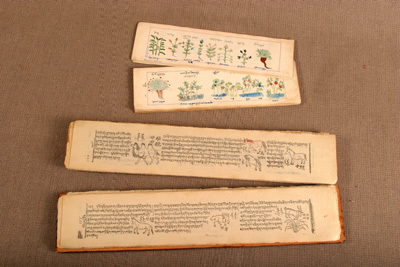 The COMX possesses a unique collection on Indo-Tibetan medicine. Above: hand-written illustrated manual to identify medicinal plants. 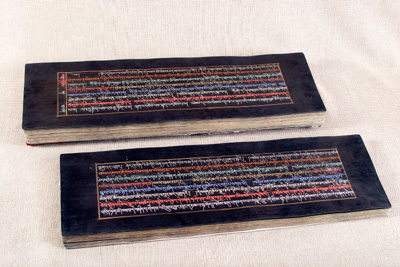 Below: A unique xylographic Tibetan - Mongolian - Chinese - Manchurian reference-book on medicinal raw material "Jeitshar Migchjan"
Special attention is given to the digital methods of conservation and presentation of the COMX collections. Electronic cataloging of the collections, scanning of monuments with the use of a highly productive color large-format scanner are being carried out, thematic databases to be located in the Internet are being created. The COMX takes an active part in the public and cultural life as a museum and exhibition center. This many-sided activity is aimed at fulfilling the mission of the Centre to conserve and properly present the richest historic and cultural heritage of Inner Asia and East Siberia. Буриад судлал. II боть, № 2 (002). Детские дошкольные образовательные учреждения и проблемы возрождения национального языка в Республике Бурятия (опыт социологического анализа). История происхождения баргутов. Улан-Удэ: Изд-во Бурятского научного центра СО РАН, 2008. 188 стр.